Teacher of Hebrew at Oxford University. Born about the middle of the seventeenth century; died about 1710. He was a brother of the celebrated Jacob Abendana, the distinguished Spanish physician and ḥakam. Having lived at Hamburg and Leyden, where he studied medicine, he settled in England, and there became professor of Hebrew at Oxford University. 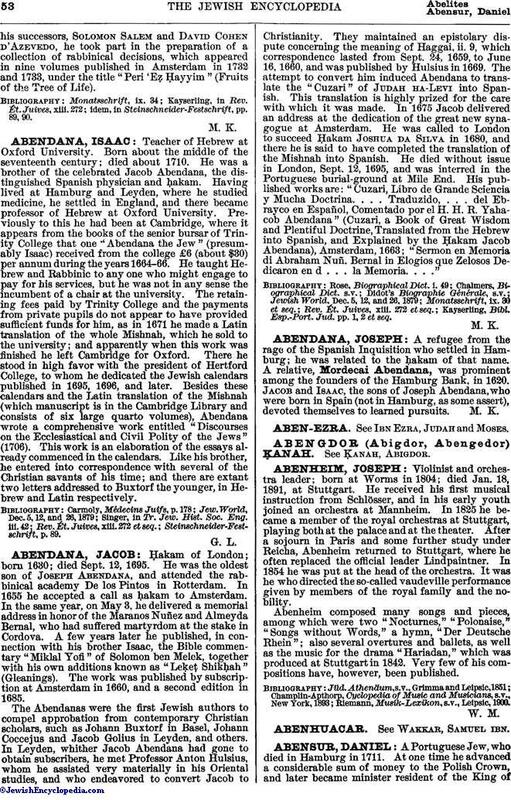 Previously to this he had been at Cambridge, where it appears from the books of the senior bursar of Trinity College that one "Abendana the Jew" (presumably Isaac) received from the college £6 (about $30) per annum during the years 1664-66. He taught Hebrew and Rabbinic to any one who might engage to pay for his services, but he was not in any sense the incumbent of a chair at the university. The retaining fees paid by Trinity College and the payments from private pupils do not appear to have provided sufficient funds for him, as in 1671 he made a Latin translation of the whole Mishnah, which he sold to the university; and apparently when this work was finished he left Cambridge for Oxford. There he stood in high favor with the president of Hertford College, to whom he dedicated the Jewish calendars published in 1695, 1696, and later. Besides these calendars and the Latin translation of the Mishnah (which manuscript is in the Cambridge Library and consists of six large quarto volumes), Abendana wrote a comprehensive work entitled "Discourses on the Ecclesiastical and Civil Polity of the Jews" (1706). This work is an elaboration of the essays already commenced in the calendars. Like his brother, he entered into correspondence with several of the Christian savants of his time; and there are extant two letters addressed to Buxtorf the younger, in Hebrew and Latin respectively.